Who is your target audience? Who exactly will be those prospective guests and/or clients who will be visiting your website (or exhibitor’s booth) and exactly what are they looking for? How great are the current photos of your hotel, villa or venue? Excellent stills and panoramic/360 degree images are absolutely critical in capturing and maintaining the interest of prospects. Traditionally promotional videos tend to be a good tool for marketing to the leisure traveler. If one is looking to create a great promotional video then this is not the time to look at the cheapest method to do this. An amateur video shot using your camcorder or smartphone just won’t do and, in fact, could do serious damage to your brand. Remember your prospective guest or planner is looking to get a good idea of room layouts, amenities and surroundings of the property. Therefore the production crew selected for this video production project should have a proven track record and portfolio in the creation of hospitality promotional videos. graphics and special effects in post-production. Video production can get quite pricey but remember the idea is to convert more viewers into paying guests. A venue or property with no video or a crappy video runs the risk of attracting much less visitors to its website and thus potentially less bookings. However, also remember in this era of short attention spans the average viewer abandonment rate is 45% after the first minute – even higher if the video lacks appeal. So the suggested rule of thumb is to create a video which is 1 minute to 1.5 minutes long. If you do not think that you can show the entire property in this short of a time then you may want to think about creating a number of sub-videos with each one focussed on a particular areas (e.g. golf course, spa, accommodations, dining, etc.). Yeap! That potentially means that your budget for video production just went up! 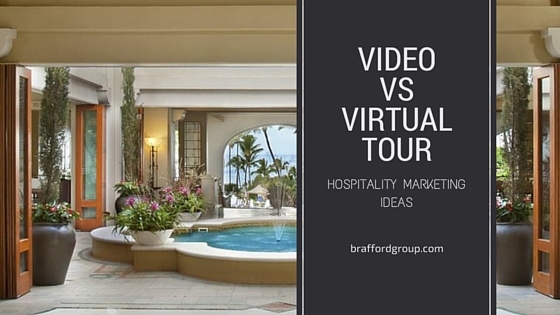 Virtual tours in the hospitality world are known by many other names. 360s, 360-degree virtual tours, panoramic images and virtual reality are a few that come to mind. These tours give leisure and business travelers the opportunity to visit a property virtually before booking – giving them an opportunity to view the accommodations and amenities without the need to be physically on-site. For the wedding, meeting or event planner the virtual tour is pure gold! They do not have to sit through minutes of an entire video to see the event spaces, conference rooms or meeting rooms that they are really interested in. The virtual tour allows them to click on and view the exact location(s) of the property that they want to see. For the property owner and marketer the virtual tour usually works out to a fraction of the cost of a video. This does not only relate to initial cost but also the longevity of the virtual tour. It tends to work out cheaper to update a virtual tour as a property goes through such things as renovations, change of branding, etc. With a video this would usually require a complete reshoot! The tour provides a slightly different role in the sales cycle and in many cases shortens the sales cycle and can deliver a greater return on investment. Many hotels and event venues already have an online photo gallery reflecting key aspects and areas. If some of these images are impactful and are of an acceptably high quality they can form the foundation on which you build your virtual tour. What existing images of the property will be used? Will new images be required and if so how many? Will there be just stills in your tour or will you include panoramic views as well? Will you include interactive local area and resort maps? Are you just showcasing the event spaces or the entire property? Will users be able to book rooms or submit an RFP via the vitual tour portal? The property’s sales team will truly benefit from this tool because, whether the prospect is sitting beside them, on the phone or on-line, they can take them on a tour virtually and guide them directly to the space(s) that will best serve their needs. Selecting a progressive virtual tour provider ensures that your tour can now be viewed via iOS and Android devices as well as be downloaded to USB drives or other media for distribution to clients or to showcase at tradeshows. So the virtual tour is no longer just resident on their website but can now be effectively distributed wherever their prospects may be. And with the incorporation of standard Virtual Reality functionality in the newer platforms you can give users a truly immersive experience. What are typically the “rules of attraction” for a prospective guest or client in the booking cycle? The first thing would be good photography. If prospective clients are on your website and the images in your gallery and on your site truly grab their attention then their interest will be peaked. If they like what they see they will go to seek out reviews on your property. In the final stage of selecting a room or requesting a quotation for an event space the ability to experience a virtual tour can prove to be the icing on the cake. In summary both videos and virtual tours are great promotional tools and give the prospect a different perspective of the hotel, villa or event space. A video is very similar to a television commercial – generating a broad awareness of the hotel or property. A virtual tour can really simulate a tour of the property and is typically used to close the sale for wedding, meeting, event and group bookings. If you can afford to do both – then do both. However, if you need to choose use the guidelines above to determine the better option for you. In the comments section below we would love property owners and sales and marketing professionals to share how they view and use these two tools in their online marketing strategy. For those of you who would like further advice or assistance in the creation of high resolution, attention grabbing still images for your online and offline property marketing campaign, or are interested in upgrading or developing your virtual tour, or just having a review of your exiting tour conducted, contact us today! We have a team with over 19 years of experience in these areas and would be quite willing to guide you through the process.